Trillium Traveler: Smoky Mountains - Again! Last night we did it again. Left the Mountain Nature around 4pm. Things had slowed for the afternoon so we headed out to do a bit of wild flowering. We decided to go into the Smokys after seeing some of the blooms last week we knew the time was here. We couldn't pull ourselves to stop on the way over toward Sugarlands. Jean had heard there were Bleeding Hearts blooming on the Little River Road. We didn't find any but, we did find loads of Trillium just about everywhere, as well as, other wild flowers. More on this later. 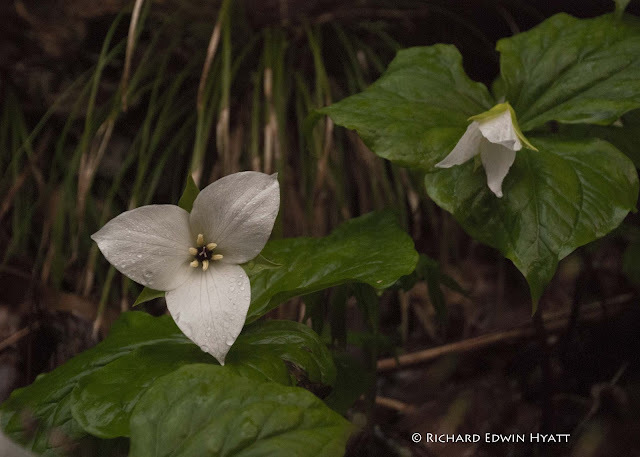 Sweet White Trillium Trillium simile. Notice the broad white petals with a dark purple ovary and cream colored stamen define it from other white trilliums. These are found now along the Little River Road.